Pure water use is the only choice for those that care about the environment and our planet. With no added chemicals or detergents, there is no danger to your plants, pets and - most of all - your family. 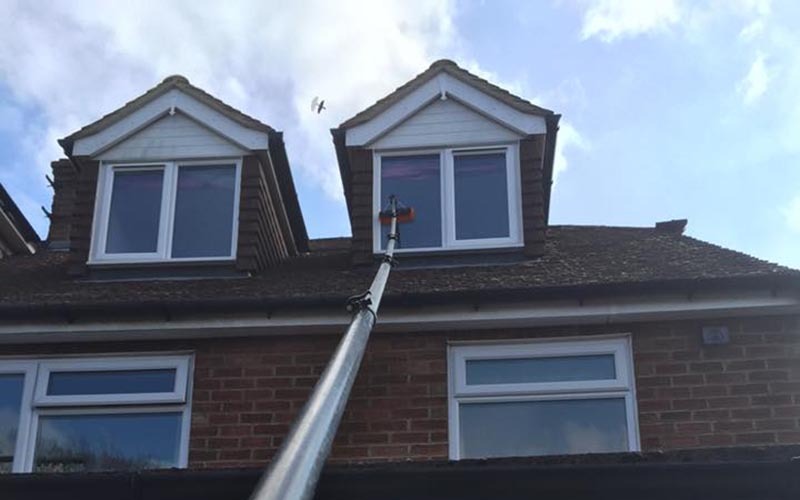 Water fed pole window cleaning is the latest technology in pure water window cleaning which has revolutionised the industry over recent years. 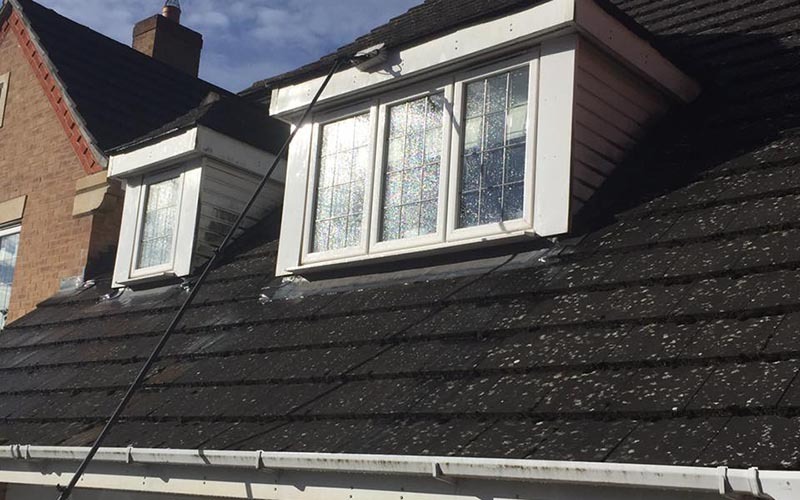 Pole window cleaning with pure water filtering has rendered ladders obsolete. The result is a more efficient, more effective and safer delivery of service in less time. Surprisingly these latest systems use only pure, filtered water to achieve perfect results. The soft bristle brush removes dirt particles and smears on the glass whilst the pure water can be left to dry naturally without leaving water stains. This technique also means windows stay clean for longer, as there is no soap residue to mix with rain and create stains afterwards as quickly. The Reach & Wash System consists of a 5 stage water treatment system and carbon fibre poles to deliver 100% pure graded water to the window or facade surface. The treatment process utilises reverse osmosis and mixed bed de-mineralising resin to produce PURE water. As no chemicals or detergents are used, the process is environmentally friendly :). The nature of de-mineralised water is to strive and return to its natural state by actively absorbing all dirt, chemicals and minerals it comes across. When used for window cleaning, provided the correct technique has been used, the final rinse water dries to a perfect finish. In fact the window is not just clean, it is left totally sterile. High reach poles deliver chemically pure water to heights up to 60 feet. This almost entirely eliminates the use of ladders - we only use ladders to gain access on some properties. This simple step allows our operatives to remain on the ground during cleaning: a much safer method and one which enables us to meet the latest Health & Safety Executive proposals for working at height. Pure water consists of just two elements, Hydrogen and Oxygen - hence the chemical name H20. Typically ‘clean’ water contains many elements; Aluminium, Chloride, Copper, Fluoride, Foaming Agents, Iron, Manganese, Silver, Sulfates, and Zinc - and that’s just drinking water! The quality of our water is the same as used in laboratory processes and we regularly test our water using a ‘Total Dissolved Solids’ meter to ensure its purity, giving a spotless, streak-free finish! All those extra chemicals decrease water’s ability to clean and leaves residues, smears, calcium deposits and other unwanted impurities dried onto your window. Especially so in hard water areas. Residues are also left by chemicals traditionally use to clean. Detergents leave a sticky film, increasing dirt build up and making cleaning harder. 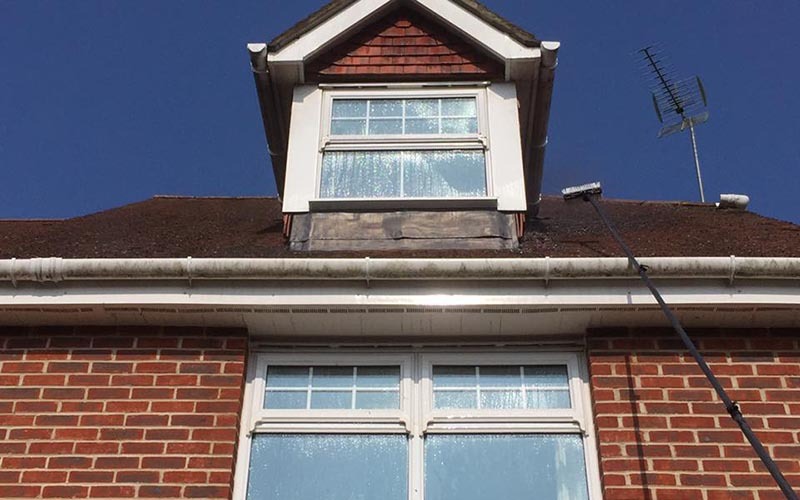 Due to the sterile state the windows are left in after pure water cleaning, future contamination and build up of dirt is much slower process.